Bring on the new wine releases, it’s another vintage in bottle, ready to be popped! Fresh, aromatic, and intensely flavorful, Santa Barbara County wines are diverse, with more than 50 different varietals grown. 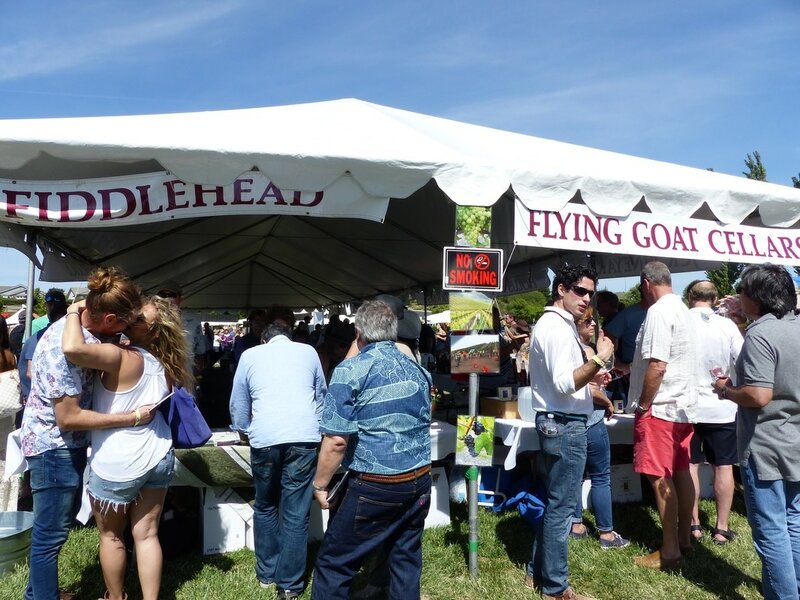 Their famous Pinot Noirs, Chardonnays, Syrahs, and Cabernets have been joined by the newest varietal wines of the County; whites such as Albariño, Grenache Blanc, and Viognier; Rosés of Syrah, Grenache, and Pinot Noir; and reds from Mourvedre and Sangiovese, to mention a few. The dramatic landscapes and ocean breezes shape the many microclimates, which give these wines fully developed flavors and a distinctive personality. Trending now, it’s an exciting winegrowing region, with ultra premium wines crafted by innovative winemakers. 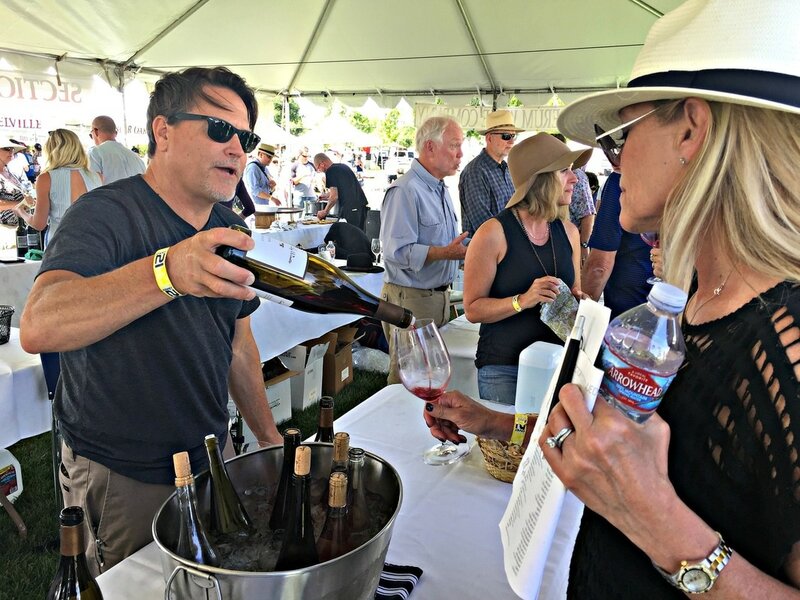 The annual Santa Barbara Vintners Spring Weekend, held in April, offered wine lovers a perfect opportunity to taste the new releases, and discover some of the more unusual wines of the region. Over a four day weekend, wineries opened their doors for wine tastings and special events, such as vineyard walks, barrel tastings, and winemaker dinners, with the spotlight on Saturday’s Festival Grand Tasting, where over 90 member wineries poured their new and current releases, along with a Saturday morning seminar that brought together six winemakers who offered something different for the region. 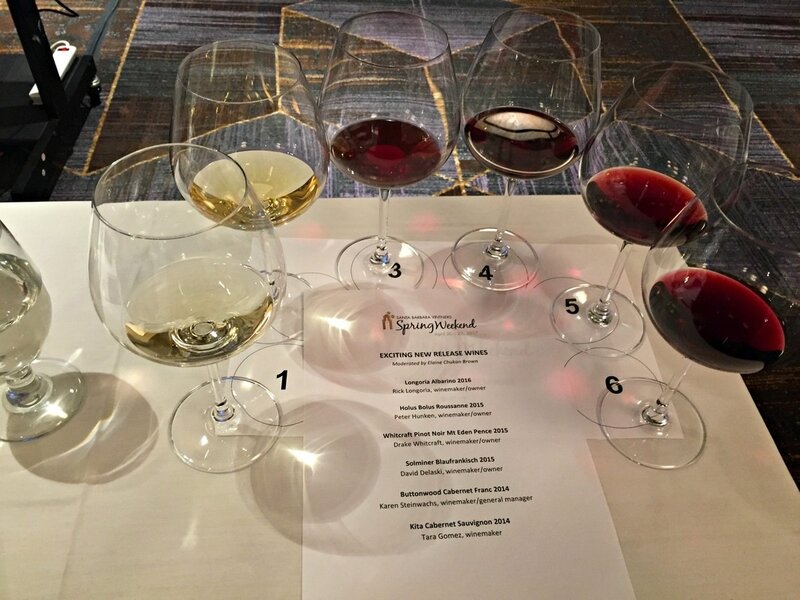 An in-depth exploration of six wines, aptly named “Exciting New Release Wines”, looked at some of the more unusual varietals or incarnations of regional favorites. 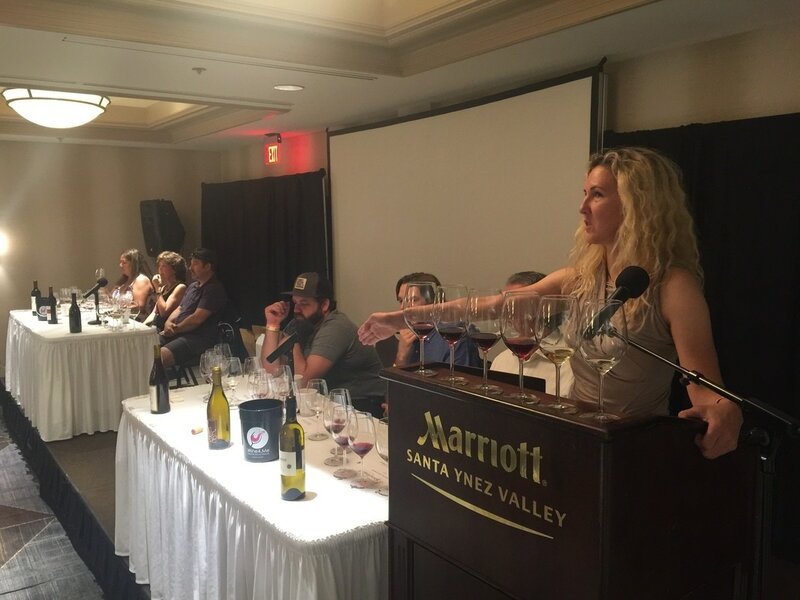 Prominent wine writer Elaine Chukan Brown presided over a panel of six winemakers, with lively discussions of what inspired the wines they presented. 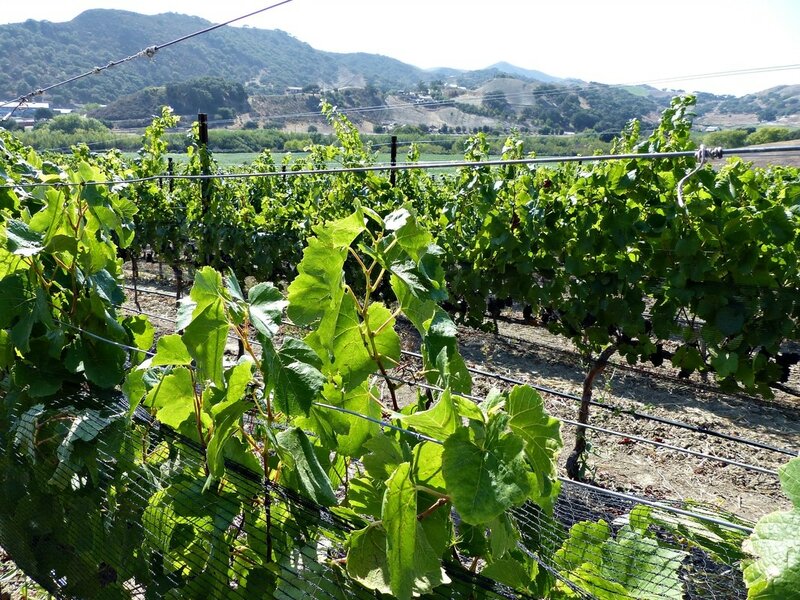 Brown described the factors that make Santa Barbara County wines so fresh and intensely flavorful, a combination of higher UV levels and ocean breezes. Brown elaborated, “ UV exposure brings out flavor development and aromatics, it helps evolve what’s happening in the grape’s skin, and the proximity and cooling influence of ocean breezes tightens up the body of the grapes, you get this really lifting aromatic from that UV sun exposure, that flavor evolution, but then you have that tightening of the structure, that freshness component.” And that was the common thread of this host of wines, that freshness and intense flavor, along with what Santa Barbara winemakers call salinity, basically a mineral component that really stands out in these very special wines, making them a “buy” for your home wine cellar. 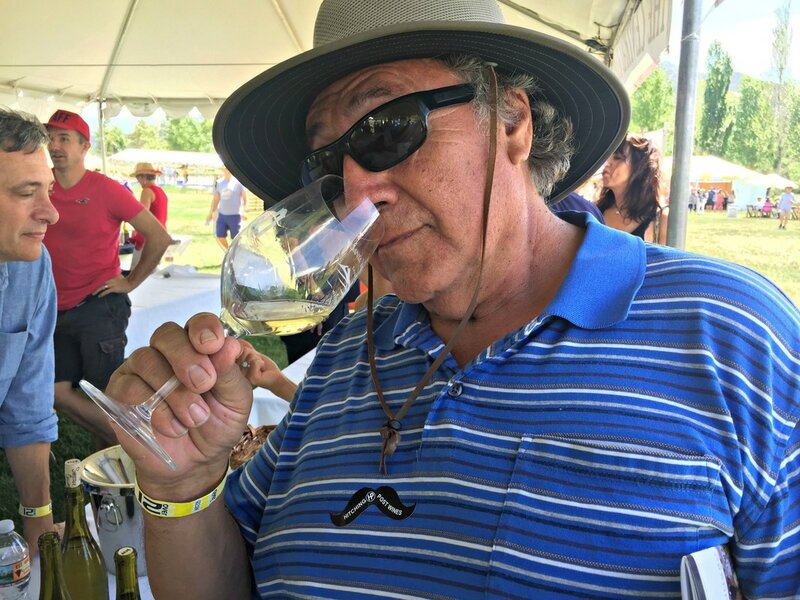 Peter Hunken poured his Holus Bolus Roussanne 2015, inspired by another pioneer of the region, Bob Lindquist, who championed Rhône varietals in California. Hunken found Roussanne challenging to grow, but discovered that “when it’s planted in the right place, it can make a really wonderful and profound wine.” Sourced from the legendary Bien Nacido Vineyard, this wine has all the richness and texture that Roussanne should have, along with a backbone of acidity and that mineral essence, as Brown pointed out, “more fleshiness on the palate, but it still closes so tight and clean, with that mineral element, you have that combination of really generous flavor and that real clean mineral finish.” Roussanne ages quite well, as Hunken disclosed, it can be drunk for the first three years, but then wait until it reaches 10 years, when it gets even better. This wine was subtle and textured, with that intriguing saline finish, perfect for many different foods. 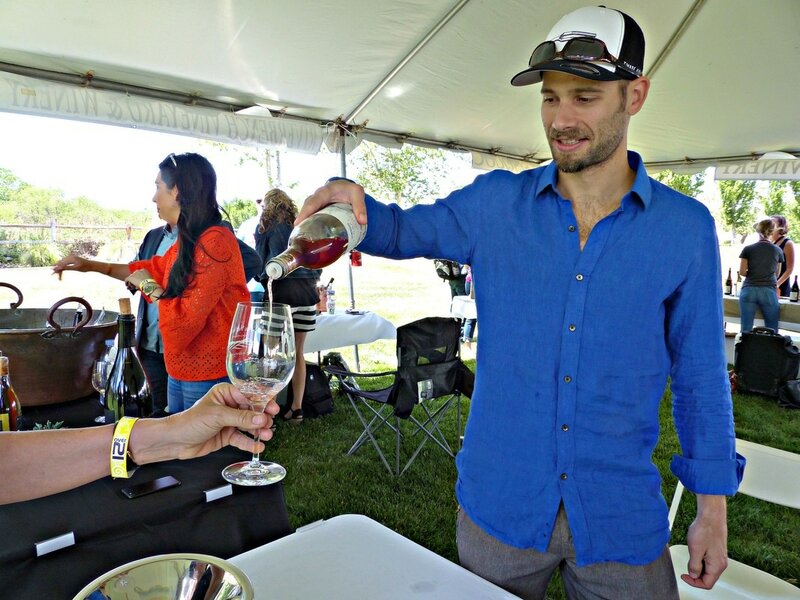 Drake Whitcraft offered a different spin on Pinot Noir, one of Santa Barbara County’s signature grapes. The Whitcraft Pinot Noir Pence Ranch Mt. Eden Clone 2015, made from the Mt Eden clone, is made with whole clusters, hand sorted, lightly foot-stomped, a short maceration, then the free run juice is fermented into wine, and aged in neutral French oak barrels, a minimal approach to high quality Pence Ranch fruit. Whitcraft noted, “It’s easy to make wine taste like fruit, but harder to bring out the subtleties.” Brown observed “the whole cluster really stands out, you still get fresh berry flavors, pure red fruits, and oceanic salinity through the finish” and Whitcraft agreed, “the terroir of Santa Barbara County is salt, you smell it in the air, you see it on the berries, it’s a major part of the wine.” It’s an easy-drinking wine, with a combination of high acidity and pH levels softening it a bit, with a savory aspect that expresses itself in spice, as one attendee noted, an explosion of spice, baking spices and white pepper, that give the wine finesse and flavor. David Delaski presented the most unusual wine, the Solminer Blaufrankisch 2015, an Austrian varietal experiment inspired by his wife, who is from Austria. Delaski felt the grape would do well in the newly crowned Los Olivos District AVA, and assisted by Steve Clifton of Palmina and La Voix wines, he grafted over three acres of his Delanda Vineyard to Blaufrankisch. It’s different from its European version, as Delaski mused, “We say it feels like an Austrian came and is just hanging out in California, it’s relaxed, more approachable, with more fruit, and a little darker.” Delaski found that Blaufrankisch has a Gamay quality, fresh, darker fruit flavors, blue, black and plum fruit, pomegranate, and allspice, with a similar weight to Pinot Noir yet a little more tannin. Brown found this wine illustrated the diversity of the County, and a great example of discovering unusual varieties that grow well here. Karen Steinwachs revealed her Buttonwood Cabernet Franc 2014, a difficult grape but beautiful wine. Steinwachs contemplated the dilemma, “It is one fussy, finicky, diva grape, very thin-skinned, in temperament as well as physical character”, requiring the Goldilocks treatment, just the right amount of sun, wind, and clusters on the vine. 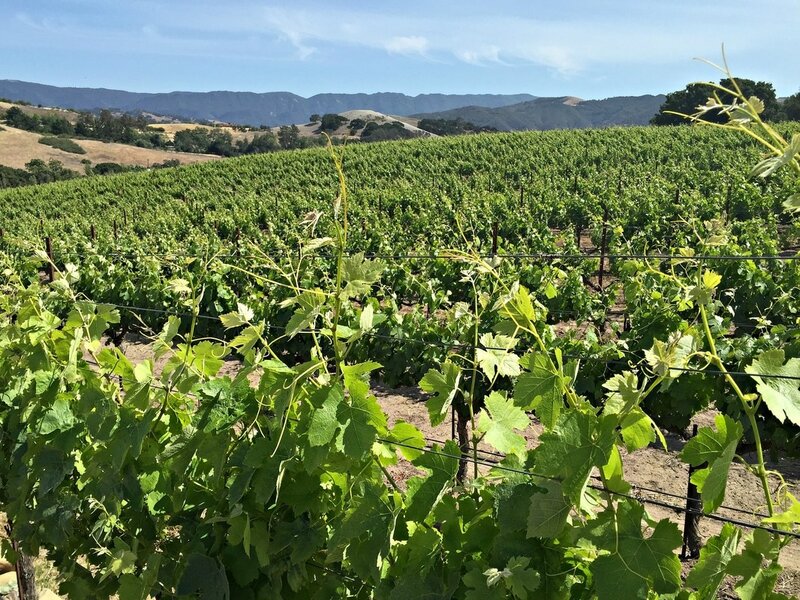 Cabernet Franc has the longest hang time of any varietal in Santa Barbara County, the first one to see budbreak and the last one to be harvested. 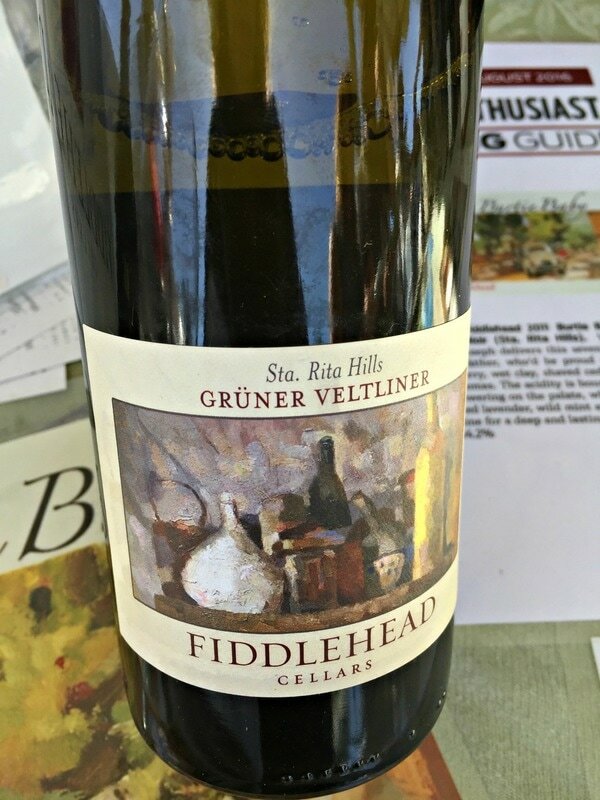 This long growing season gives the fruit time to slowly develop, resulting in a profound depth of flavor, and this wine was so lovely, savory, with good acidity, a thread of oak melded the grape and oak tannins, accented by a touch of spice, a well balanced beauty that reflects the care in winemaking. 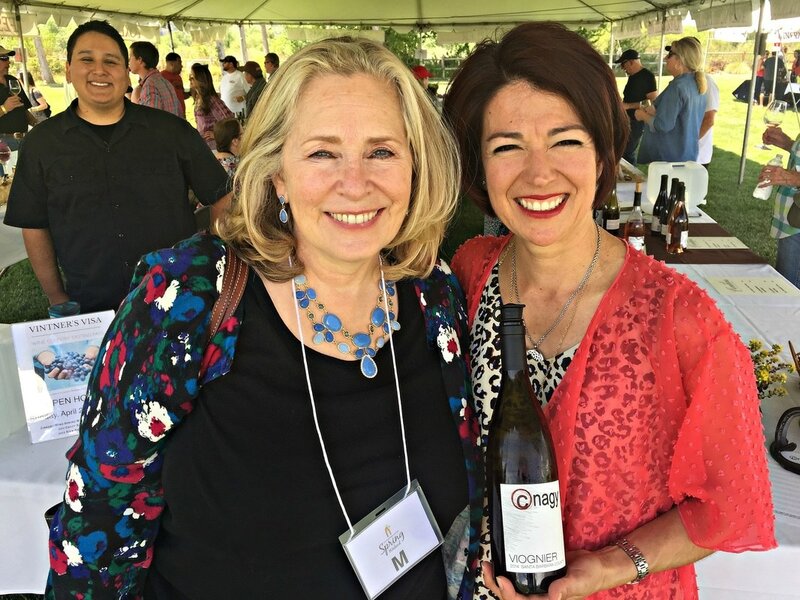 Tara Gomez displayed an unusual version of Cabernet Sauvignon, choosing a fresher, younger rendition of one of California’s most popular grapes. 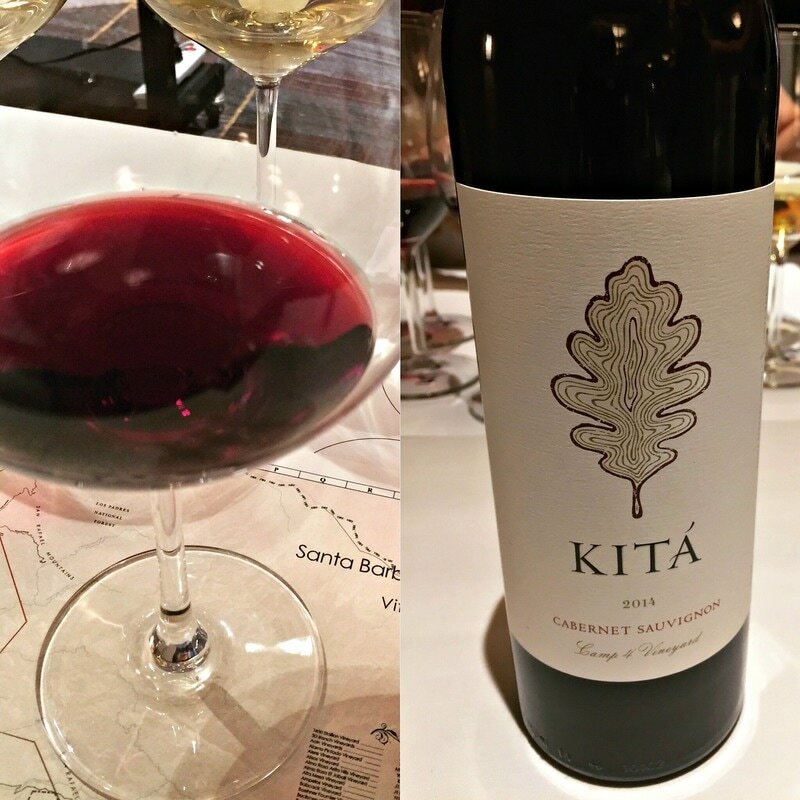 The Kitá Cabernet Sauvignon 2014 is sourced from their Camp 4 Vineyard, originally planted by Fess Parker. Gomez takes a different approach, “I like to pick early, to try to retain that natural acidity, going through the vineyard for 2 or 3 picks to capture that freshness, spaced out with a little later pick to help build the structure.” This gives the Kitá Camp 4 Cabernet some greenness to balance the fruit, but with cold-soaking, pumpovers, barrel-aging, and lees stirring, it has a nice mouthfeel. As Brown discerned, “there is a green note, and black pepper, it’s really a fresh and focused style, very structured with high acidity, the finish is quite long, there’s this dry firm tannin but still mouthwatering at the same time, it’s a nice combo, an approachable mouthfeel.” And you can see through this Cabernet Sauvignon, a transparent ruby color that belies the amount of flavor in the wine. Brown explained that Santa Barbara County winemakers have greater flexibility in making the wine they want to, with the longest growing season along the West Coast. 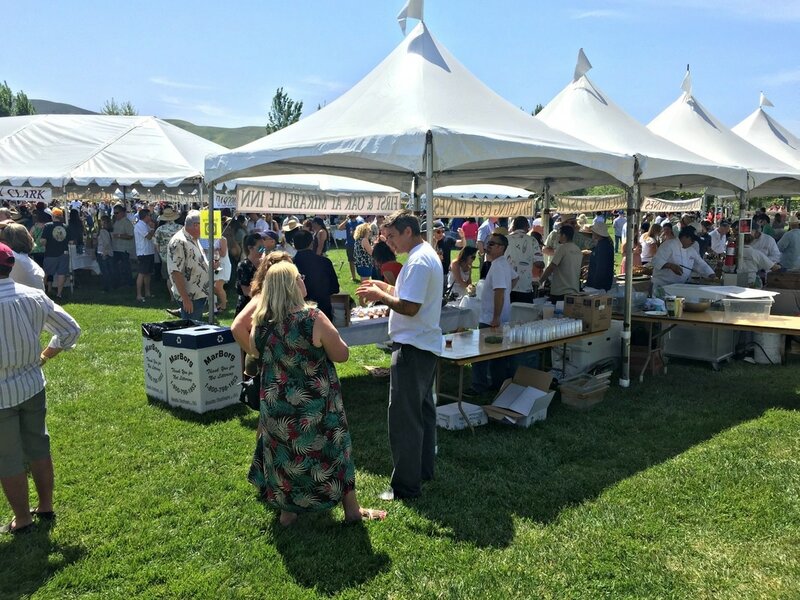 The Festival Grand Tasting, held in River View Park in Buellton, featured a collection of white tents, arranged by Santa Barbara County’s individual wine trails, which helped the consumer get a better understanding of the wines’ characteristics and what distinguishes them from each other. Owners and winemakers poured tastes of their new and current releases, accompanied by other festive trappings, tasty bites from more than thirty restaurants, caterers, and food suppliers, live music, wine and culinary demonstrations, and a silent charity auction of large format bottles, whose proceeds benefit many community organizations. Overall, the trends this year were fresher, more balanced wines, with single vineyard designations becoming more plentiful, and a big push towards sparkling and rosé bottlings. Here are a few highlights of the wines I tasted, and apologies to all who I didn’t get a chance to sample. 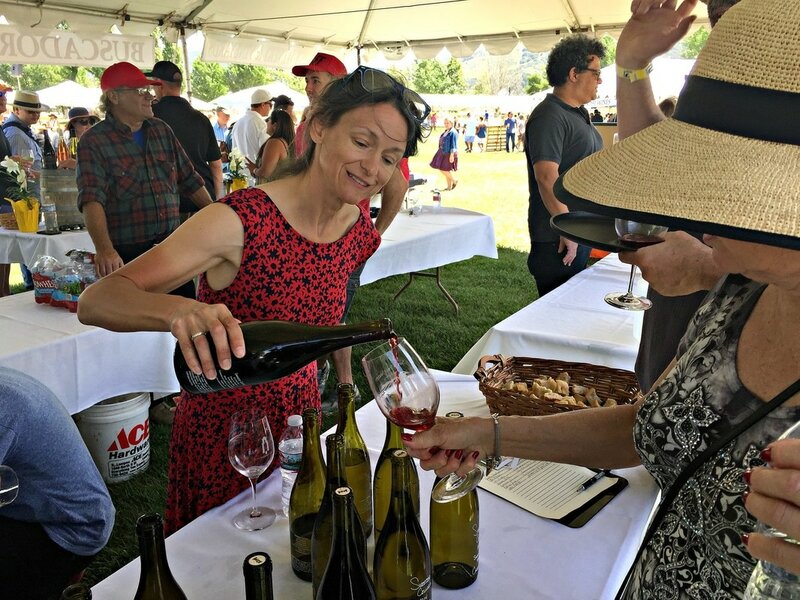 Clarissa Nagy of CNagy Wines poured three examples of her elegant winemaking style, each so expressive and delicious, the 2014 White Hawk Vineyard Viognier, the 2015 Bien Nacido Vineyard Pinot Blanc, and the 2012 Santa Maria Valley Pinot Noir. 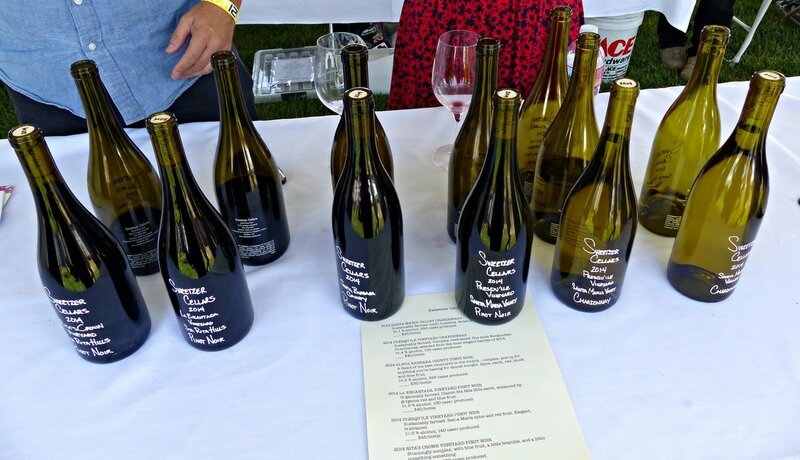 The biodynamic brilliance of Ampelos Cellars was on display, the “Phi” Viognier 2016, Rosé of Syrah 2016, “Lambda” Pinot Noir 2013, “Sigma” Syrache 2013, and “Gamma” Syrah 2012, all estate grown and certified organic and SIP, so alive in their varietal expression. 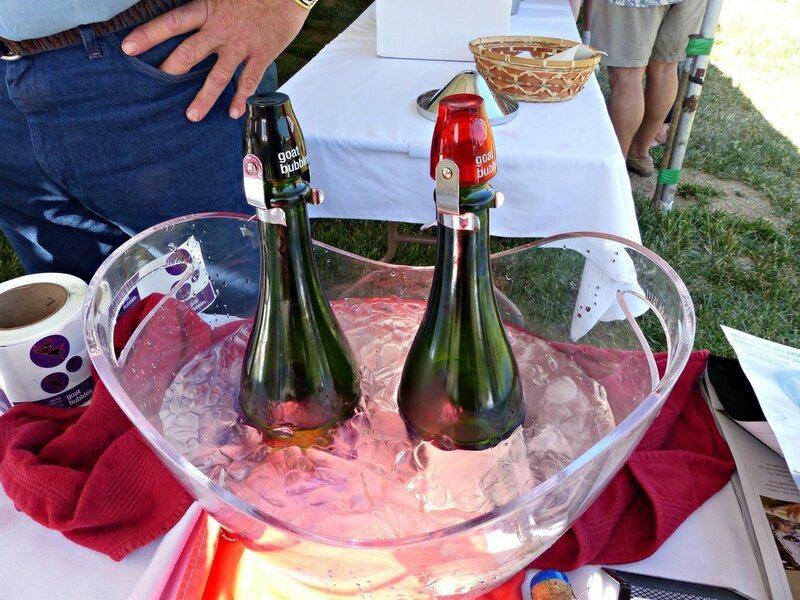 Norm Yost of Flying Goat Cellars was on fire with his bevy of beautiful “Goat Bubbles” sparkling wines, the 2013 Crémant was fresh and toasty, along with a couple of single vineyard Pinot Noirs. 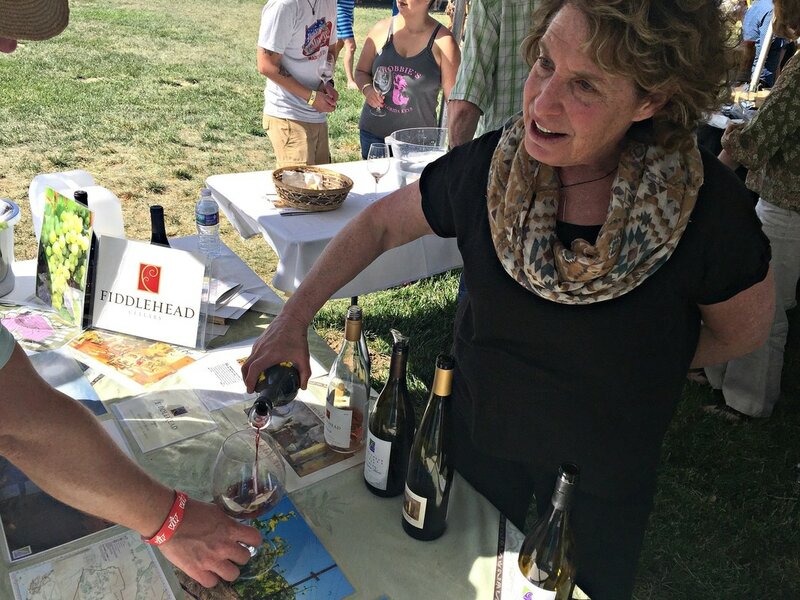 The enthusiastic Kathy Joseph of Fiddlehead Cellars poured a fabulous “Pink Fiddle” 2016 Rosé of Pinot Noir, “Lollapalooza” 2012 Pinot Noir, “Seven Twenty Eight” 2012 Fiddlestix Pinot Noir, and the flavor bomb, the 2013 Sauvignon Blanc. 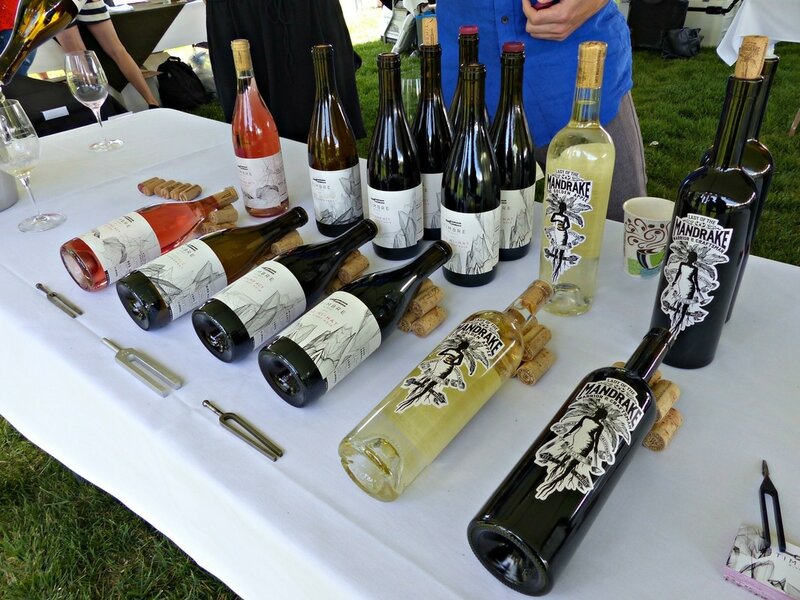 New offerings were the 2013 Oregon Pinot Noir Oldsville Reserve and the SRH Gruner Veltliner. 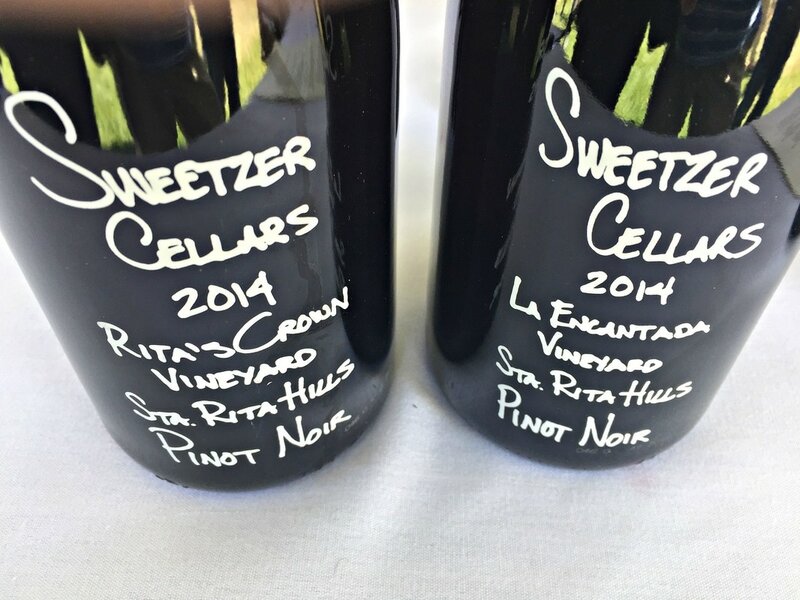 Michael Fogelman and Lisa Liberati of Sweetzer Cellars shared six expressive wines, Chardonnay and Pinot Noir, that come from some of the best single vineyards in the area for the 2014 vintage. The Rita’s Crown is a stunner, so complex, but each has its charms, La Encantada, Presqu’ile, and the Santa Barbara County blends. Sweetzer has an incredible story, self-taught winemakers who started making wine in their LA apartment, check back here for their in-depth profile coming soon. 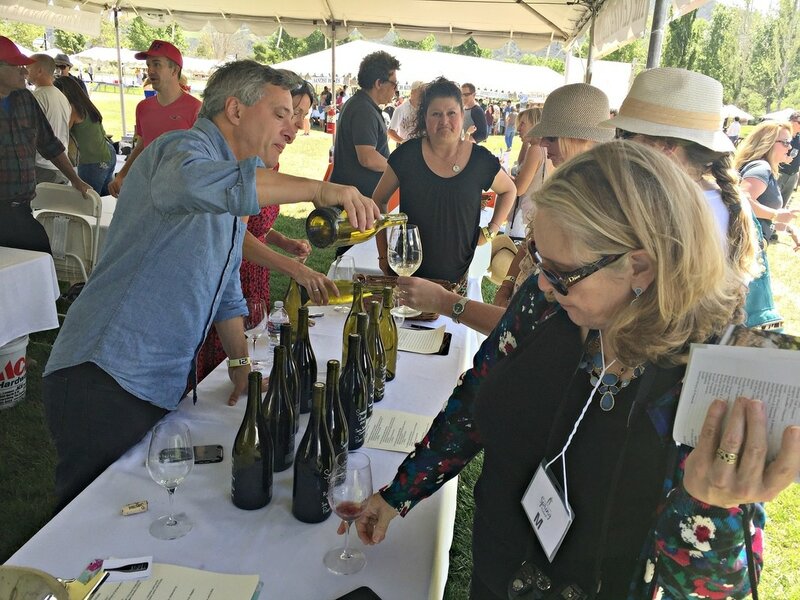 Mark and Wendy Horvath of Crawford Family Wines poured pure expressions of 2016 Albariño, 2016 Rosé of Grenache, 2015 Sta. 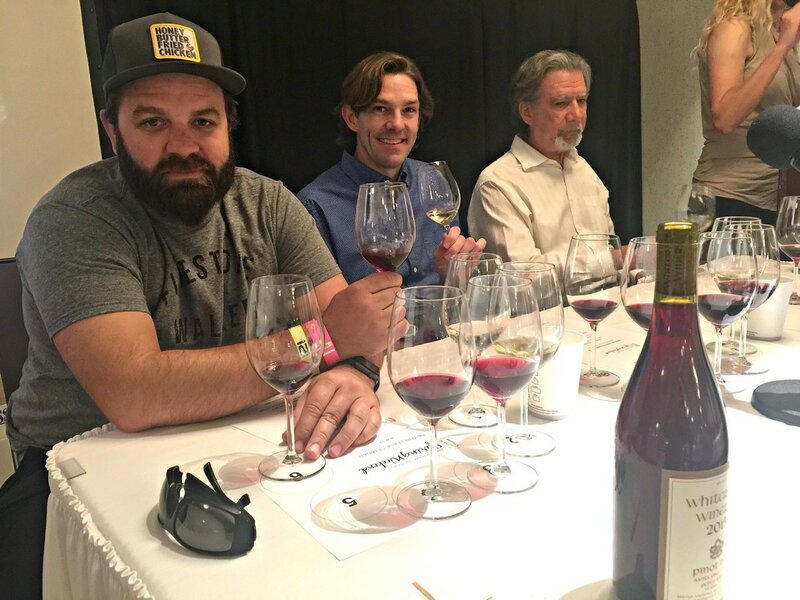 Rita Hills Pinot Noir, and 2014 Second Street Cuvée, a blend of Grenache, Syrah, and Mourvédre. This labor of love is a family affair, as they unlock the magical varietal flavors within their wines through a minimalist approach. Timbre Wines, formerly La Fenêtre, is the project of Joshua Klapper and Alex Katz. Dedicated to producing savory wines of distinction, meant for food, the wines are thrilling. 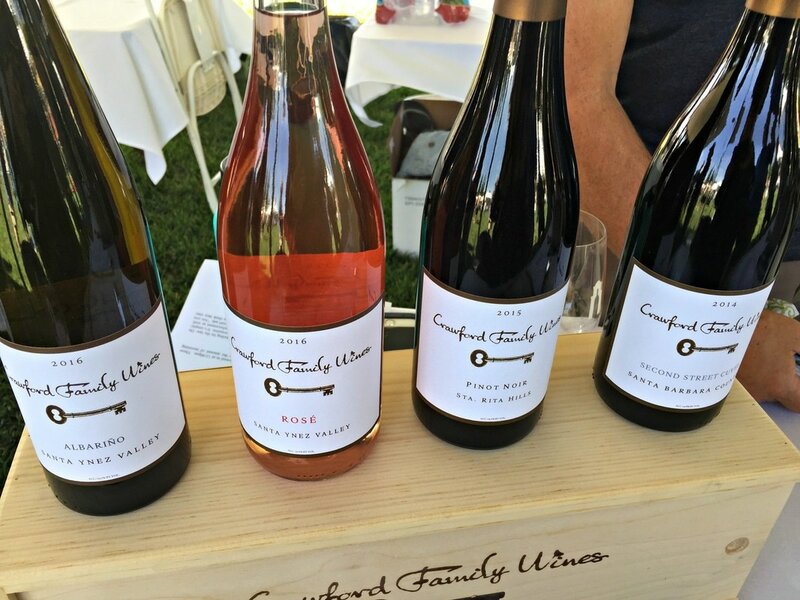 The 2016 Opening Act Rosé and Pinot Noir, 2013 Lead Vocals Chardonnay, and 2014 Hi Hat Pinot Noir are just a few of the beautiful wines they produce. 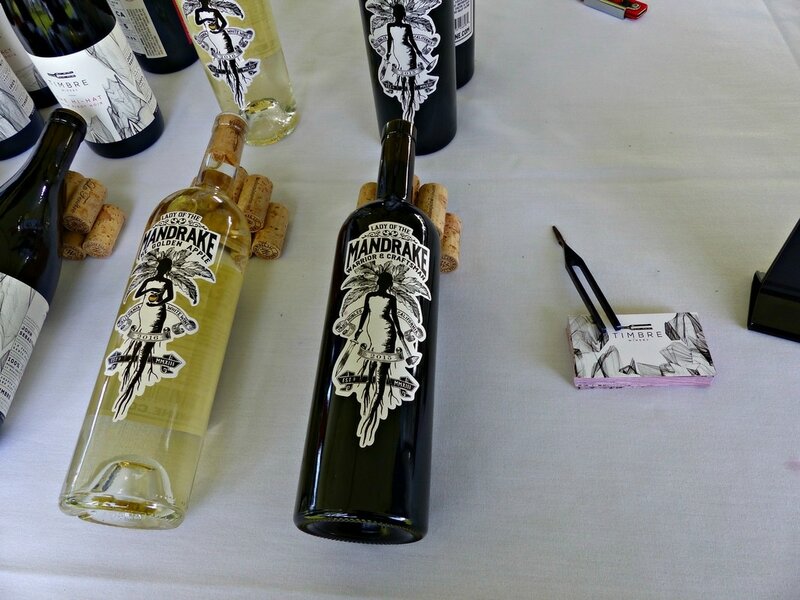 The fun Lady of the Mandrake blends, the 2016 Golden Apple White and Warrior & Craftsman Red are simple pleasures. 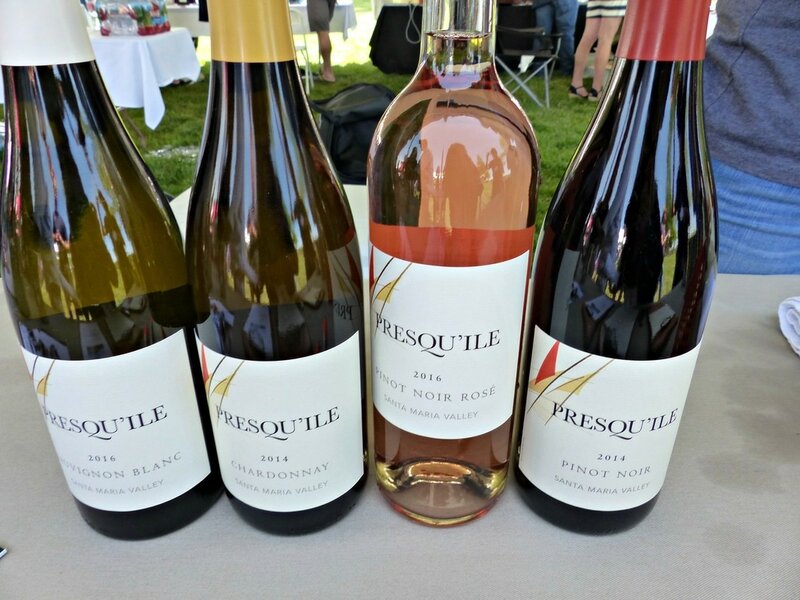 Presqu’ile Vineyard & Winery seemed to be all the buzz, with their vineyard’s highly sought after fruit bottled under many different labels. Their estate wines are balanced and intense, with lots of acidity. 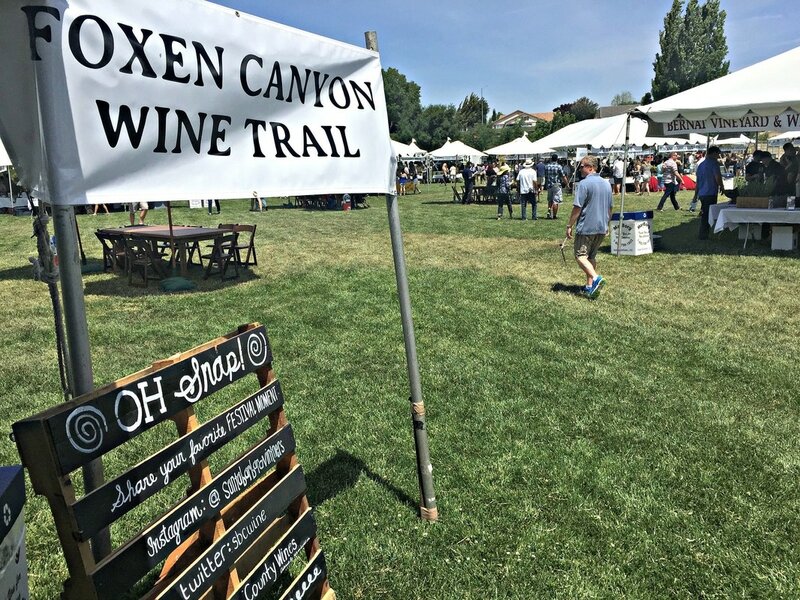 The fresh 2016 Sauvignon Blanc, 2014 Chardonnay, 2016 Pinot Noir Rosé, and fruit-driven and spice 2014 Pinot Noir were all crowd-pleasers. 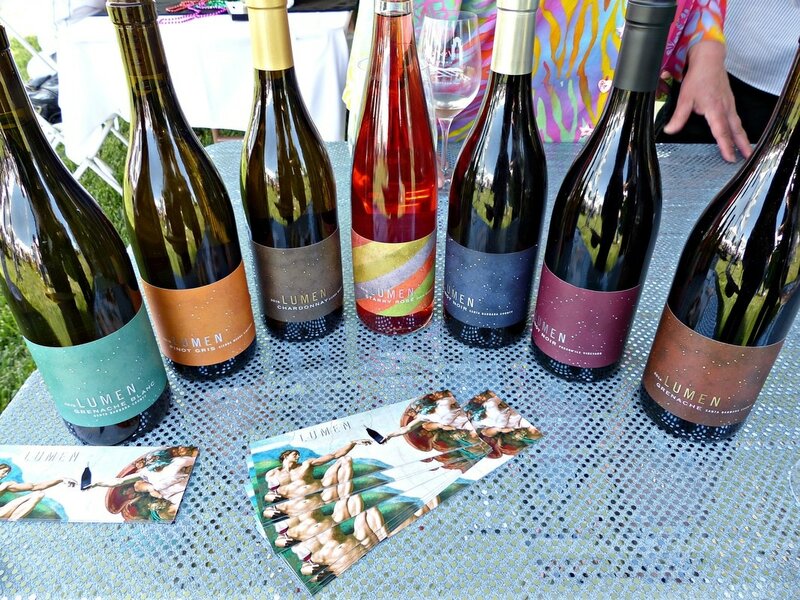 The colorful Lane Tanner of Lumen Wines offered a rainbow of intense and flavorful bottles, the 2015 Grenache Blanc, 2016 Pinot Gris, 2015 Sierra Madre Vineyard Chardonnay, 2016 Starry Rosé of Grenache, 2014 Santa Barbara County Pinot Noir, 2014 Presqu’ile Pinot Noir, and 2014 Grenache. From the region’s wine pioneers to small production garagistes, family-owned to biodynamic/organic wineries, these passion projects all share the wine paradise that is Santa Barbara County. The wines just get better and better every year, delicious on their own, fabulous with food, continually surprising with their quality and value. Festival weekends are always a great way to explore, but anytime is a good time to go. It’s so easy, only a couple of hours north of Los Angeles, Santa Barbara’s wine country charms beckon, a quick escape or a long retreat, where vineyard landscapes, beautiful wines, delicious foods, and the call of the ocean intersect, it's a magical place.